I was just given some links to a really great resource for K2 Developers. Chris Geier at K2 has pulled this together and is managing it; this is great! In it are good blog postings, K2 whitepapers, KB articles, MSDN articles, videos, etc. 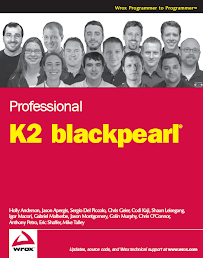 I still recommend getting the K2 blackpearl Professional book and use this information to supplement your learning of the K2 blackpearl Platform. These links have now been fixed. They were broken when K2 rebuilt the K2 Underground web site.